Have you heard about Globe Rewards? The way it goes is that basically you earn points for every reload (prepaid subscribers) or depending on your billed amount (postpaid subscribers). 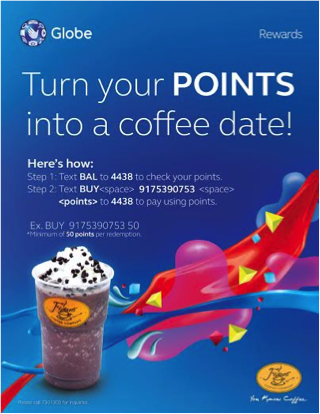 You can use these points to pay for your purchases at various partner merchants like Bench or the Ayala Malls Cinemas. I've already been able to use Globe Rewards to pay for movie tickets at Ayala Mall Cinemas. 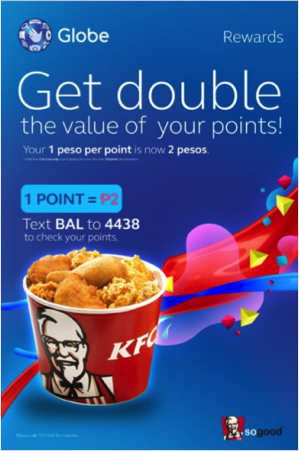 So check your Globe Rewards balance by texting BAL to 4438 and go crazy with your doubled points. There will be a promo personnel at the stores to help you out, so it's all hassle-free... AND FREE. And this is just the beginning! Globe Rewards will continue to beef up your rewards so you'll be able to get the most out of your loyalty. Makes me #GladtobeGlobe!